The NY Bagel Café franchise opportunity is marketed and sold by president Joseph Smith (aka Joe Smith) and franchise salesman Dennis Mason (aka Ken Mason, aka Keith Samuels, aka Denis Mason, aka Brian Scofield). Prospective franchisees should be aware that not only does the franchise have an extraordinarily high failure rate, Joe Smith and Dennis Mason have had more than numerous franchise lawsuits and many franchise complaints against them. (NY BAGEL SCAM) NY Bagel Café president Joe Smith and infamous franchise scammer Dennis K. Mason have a rather lengthy list of franchise disputes, lawsuits & controversies. Finding and verifying all of the lawsuits is a difficult and time-consuming process, but here is our working list to date. Please share anything you know about these or other legal actions with a comment below or by emailing us at NYBagelFranchiseScam[at]gmail.com. This investigation was the result of a complaint filed and information provided by UnhappyFranchisee.Com. State of Maryland Enforcement Order – Final Order to Cease & Desist 10/8/15, The Office of the Attorney General of Maryland issued a Final Order to Cease and Desist In the Matter of: NY Bagel Enterprises, Inc., SMS, Inc., Joseph V. Smith, Dennis Kenneth Mason, finding that Dennis Mason has continued his pattern of disregarding franchise laws and deceiving would-be franchisees with illegal earnings claims. Huebner v. NY Bagel Enterprises, Inc. NJ Court (LCV) County: Morris Docket # L 001814 12 In 2013, an arbitrator awarded Rockaway, NJ franchisee Min Huebner $385,000 in Huebner v. NY Bagel Enterprises, Inc. Dennis Mason was named as a co-defendant. MOHAMED ELSAID, v. NY BAGEL ENTERPRISES, INC., JOSEPH SMITH and DENNIS MASON L – 7968-11 SUPERIOR COURT OF NEW JERSEY LAW DIVISION – BERGEN COUNTY NJ resident Mohamed Elsaid, he was sold a NY Bagel franchise in 2011 by Dennis Mason & Joe Smith. His contract stated that his franchise fee was refundable if he failed to get funding but they refused to honor the agreement. He took them to court and won a judgement but has been unsuccessful in collecting. RIMA ALBARQAWI, BASSAM M. BARQAWI, BASIL M. ALBARQAWI v. NEW YORK BAGEL ENTERPRISES, INC. AND JOE SMITH UNITED STATES DISTRICT COURT DISTRICT OF NEW JERSEY Joe Smith’s New York Bagel Enterprises, Inc. was sued by Bassam M. Barqawi, Basil M. AlBarqawi, Rima AlBarqawi, for a $29,500 franchise fee in 2011 which was not returned. Neither Smith nor Mason would return their calls once they had the money, forcing the AlBarqawi’s to sue. The lawsuit states: “When Cunningham inquired about purchasing an NY Bagel franchise in the Summer of 2009, Defendant Mason told him that NY Bagel franchised stores were earning $10 ,000 to $15,000 per week in revenue. Superior Court of NJ, Docket No. L-4639-06 (N.J. Super. April 7, 2009) (Jamie S. Perri, P.J.Cv., entered a judgment for Plaintiffs against franchisor, principal in franchise company and franchise sales person for fraud and various contract claims, with interest, attorney’s fees and costs in the amount of $241,646 on behalf of three individuals who invested money to purchase and operate a Java’s Brewin’ franchise). DiPietro, et al v. Java’s Brewin Development, et al, case number 1:08-cv-1620 US District Court, Eastern District of NY Division, Monmouth County This lawsuit involved allegations of an illicit scheme that Mason and others employed to deceive and induce the plaintiffs into purchasing franchises. The Mousleys had operated one of 10 franchises bearing the Schmidt name, all in eastern Pennsylvania and South Jersey. Now, all but one of them have closed – victims of lagging sales and, the franchisees say, too little help from the company… Four franchisees in the group were forced to close their stores and are preparing to file for bankruptcy. They also are preparing to sue Mike Schmidt’s Philadelphia Hoagies and its owners, Richard Speeney and his sons, alleging misrepresentation, deception and possible fraud. They also plan to sue Dennis Mason, the salesman who sold them the franchises… Mason said he was not liable, because he had given the franchisees the information given to him by the franchiser. State of New Jersey # ESX L 012985 96 Mason was sued by the franchisor of Windmill Hot Dogs. ARE YOU FAMILIAR WITH THE NY BAGEL SCAM, NY BAGEL FRANCHISE, DENNIS MASON OR JOE SMITH? IF SO PLEASE LEAVE A COMMENT BELOW OR SEND US AN EMAIL. 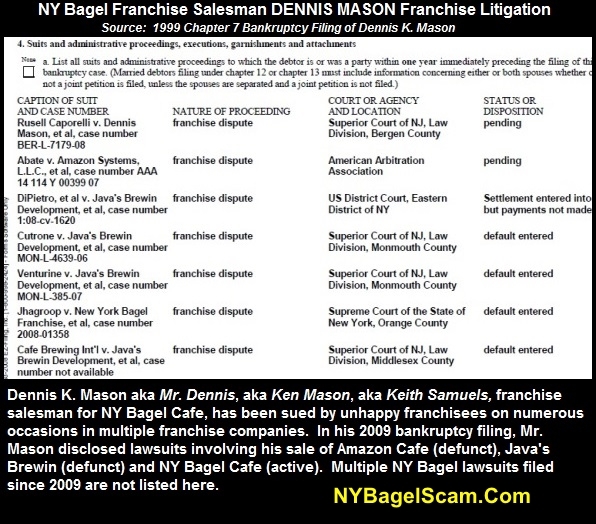 The post NY BAGEL SCAM WARNING Joe Smith Dennis Mason Franchise Lawsuits appeared first on NY Bagel Scam.